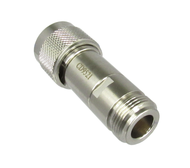 Coaxial DC Blocks allow the transmission of RF signals while blocking DC signals, usually using a blocking capacitor. We feature SMA DC blocks, 2.92mm DC Blocks, BNC DC Blocks, TNC DC Blocks, and Type N DC Blocks. DC blocks can block the inner conductor, outer conductor, or both; hence there are "inner" dc blocks, "outer" dc blocks, and "inner/outer" dc blocks. 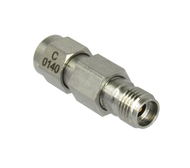 These Coaxial DC Blocks are frequently used in Satellite Systems where a control voltage is passed along with the RF signal, and the coaxial dc block protects equipment. The BNC DC block uses a precision bnc to get to 4ghz. 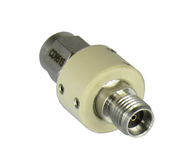 The C0927 SMA DC Block uses dual parallel capacitors to achieve its broad bandwidth, its ideal for EO & NRZ systems. Please click on a category from the drop down menu above to see our exact offerings of rf & microwave coaxial DC Blocks.